Whatever its other flaws, the "Generation 2" era of GI Joe definitely introduced a lot of new characters, rather than only spewing out variations on the existing cast. It's kind of ironic, then, that we get so excited when one of those characters is updated for Generation 3 - shouldn't we be bemoaning the fact that the slot could have gone to someone new? A Special Weapons and Tactical specialist might seem redundant in a unit as elite as the GI Joe team, but not if you consider the degree to which his skills are specialized. If there is a locked door behind which there are an unknown number of armed hostile individuals and innocent civilians, it is up to Wide Scope to kick the door down and let his canine go in first. Then he must assess the situation, choose an appropriate course of action, and carry it out, all in the split second between kicking the door down and firing the first hostile shot. Wide Scope is an extremely mellow, easy-going type of guy. He never seems to get excited about anything, maintaining a consistent, level attitude through the most disturbing and frightening situations. However, the one thing he is extremely sensitive about is his K-9 partner, to whom he has bonded intensely and will never leave his side. 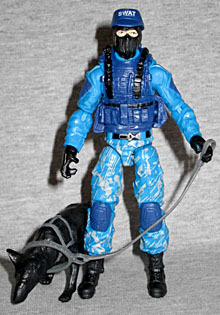 "Haven't we already had a figure of this guy" you may be asking yourself, but no: you're thinking of Shockblast, who, despite being a SWAT trooper in bright blue clothes, is not the same person as Wide Scope. He's Jason A. Faria, from Dearborn, MI, while this is Larry M. Kranseler from Newton, MA. Same head on both figures, though. Below the neck, Wide Scope is identical to the Cobra Shock Trooper. Now, Hasbro has used pieces of that mold for a lot of figures since it was introduced, but it works so well for a SWAT officer that we're not going to complain about its use here. 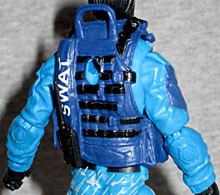 The heavy boots, the armored kneepads, the pockets on the upper arms, the fancy armored vest... it all says "SWAT," and it says it very well. What sets this figure apart from the Shock Trooper is his paint. We may be paying through the nose to get these figures, but when Hasbo is switching to simpler paint apps on its retail lines, the Collectors' Club seems to have put our money to good use (on this one). 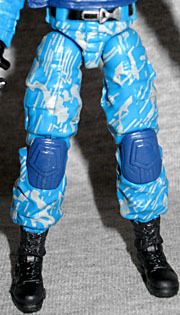 The original 2003 figure had a splotchy white camouflage on his legs, and this one honors that. Of course, the old toy looked like he's been painting his house, while this one actually looks like modern urban digital camo. The apps are gray, rather than white, but they look very nice. 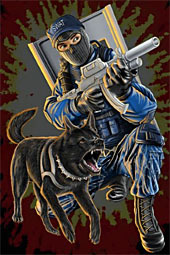 He has "SWAT" printed on his vest and his hat, and even though it's hard to see under normal light, there are black paint apps on his navy blue vest. His hat, unfortunately, gets a bit squashed by the way he's packaged: the brim touches the from of the blister, so it gets bent down by the time you receive and open him. 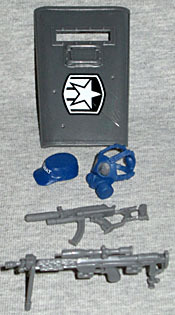 The hat originally came with Shockblast, and the same is true for his gasmask. He also has the radio that plugs into the back of his vest, the submachine gun that Retaliation Cobra Commander came with, a large shield, and the DSR-Precision GmbH DSR 1 with a removable bipod. Which does bring up an odd issue with this character's name: if he's a K-9 handler, why is his codename more appropriate for a sniper? That's opposite ends of the spectrum - a K-9 handler (by necessity) gets up close and personal, while a sniper is a distance fighter. That would be like taking a guy whose specialty is sleeper holds, and calling him "Orbital Bombardment." You can't have a K-9 officer without a canine, and Wide Scope doesn't disappoint in that regard. He's partnered with the same doggie as before, Lamont. What kind of name is "Lamont" for a dog? Well he's all black; see if you can figure out the rest of the joke from there. 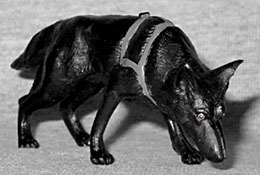 Unfortunately, Lamont uses the same mold as last time, and he was already a small dog; given the size increase the toys underwent for G3, Lamont looks like he has dwarfism. We assume he's supposed to be a German shepherd (even if he has a nose like an Afghan hound), but he's tiny! He's got a sculpted harness, and is wearing a collar that is way too big for him. The card art for Wide Scope is very good - probably the best we've seen from the Figure Subscription Service yet (at least, art that wasn't stolen from someone else). It was done by Adam Riches, and actually shows a bit of artistic talent - unlike some others we could mention. And this isn't just good by comparison to those, this is legitimately good. So good that I had a quick poke through Google images to make sure it wasn't just traced from something. Wide Scope's eyes look a tad feminine, but seriously: this is good art. Feel proud of yourself, Adam. Wide Scope wasn't one of the figures I was looking forward to in FSS 2.0 - but neither was he one of the ones I didn't want. He was completely a wait-and-see release. And while he's not great, he's the best we've gotten so far this year; that puts him in the high half of the collection.